Three browning bananas. Only one egg. Out of sucanat. Oh no. I was planning on making my go-to banana bread tonight and realized that I am short on eggs and out of my sweetener. Time to experiment and cross my fingers. I found this recipe and saw that it was possible to create a baked banana bread given my circumstances. I got excited and I got out my mixer. I took the base recipe and tweaked it. I used white whole wheat flour, I used an extra banana, added coconut oil, cinnamon, dark chocolate chips and made some other minor adjustments as you will see below. 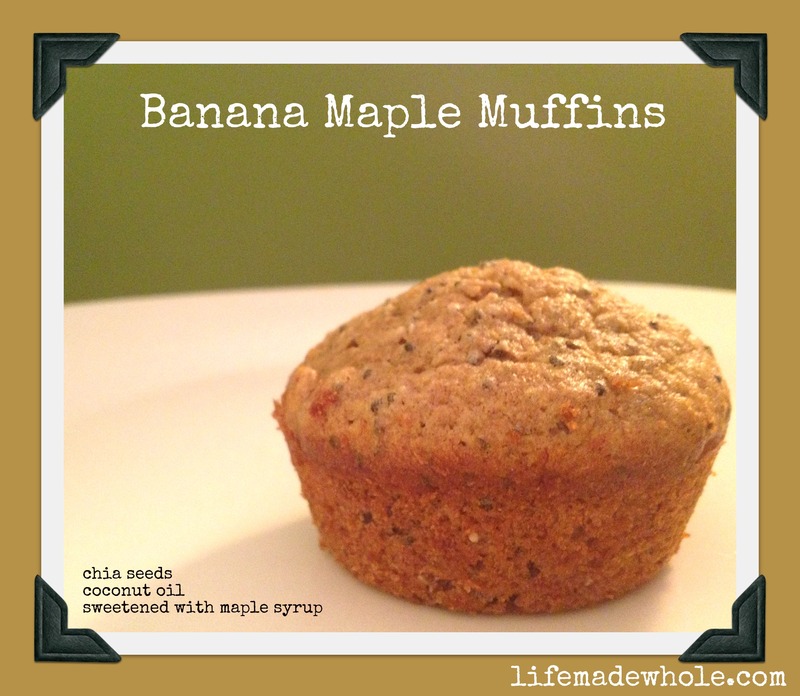 I chose to make muffins as they are nice and portable for the kids lunches or to grab and go. I was quite pleased with the end product and very pleased that I was able to use maple syrup as a sweetener!!! I love that white sugar does not dictate whether I can bake some good ole’ muffins! As a last second decision, I threw in a 1/4 cup of chia seeds, just to see what would happen. I wasn’t sure if it would have negative affect on the end product but I am happy to report their addition is awesome! You see, I have been somewhat fascinated with chia seeds of late, as a lot of people are. I bought some a few weeks ago, not knowing exactly what to do with them. I had read about their benefits, including the omega 3 aspect, that they help balance blood sugar, and are a great source of a complete protein. (they also help you feel full longer and may stave off snacking…) Until now I had just been throwing some into my yogurt and smoothies but hadn’t used them for any baked goods. Melt butter and coconut oil on stove. Pour melted butter & coconut oil into mixing bowl. Add maple syrup. Beat in the egg and bananas (until they are just small chunks remaining.) Add milk. In a separate bowl combine dry ingredients (except chia seeds & chocolate chips.) Stir dry ingredients into banana mixture a little at a time until moistened. Add chia seeds and chocolate chips and mix until evenly distributed. Pour into muffin pan. Makes 12-15 muffins. Bake for 20 minutes and cool a few minutes before placing on wire rack. This entry was posted in Desserts, Easy Kid Treats and tagged chia seeds, coconut oil, maple syrup. Bookmark the permalink.